Two days of talks in sunny San Diego with headliners Cece Moore and Blaine Bettinger, what a pleasure for the roughly 275 genetic genealogists attending. I always enjoy any talk by either of them but I had to miss a few to go to other talks, so I am really looking forward to the videos. The people who missed the conference will be able to purchase them in a few weeks from the i4gg site. 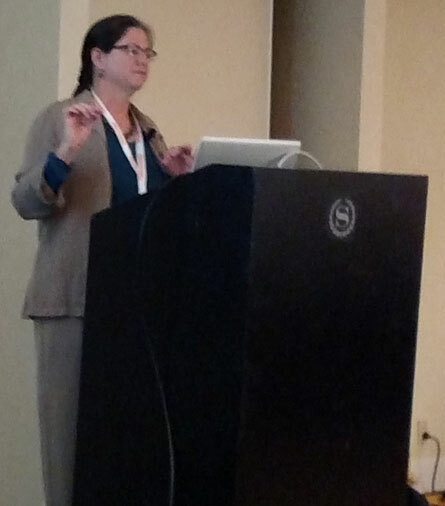 Those of you who overflowed the room for my talk on GEDmatch, thanks! 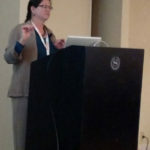 My slides are always available at slides.com/kittycooper – this talk is called GEDmatch Basics. I also have a handout in the downloads section here on my blog. So what other talks did I enjoy besides Cece and Blaine? Barbara Rae-Venter’s presentation of the Lisa project story had me on the edge of my chair and actually gave me nightmares. I don’t think I have ever had that happen before from a genetic genealogy lecture! Congratulations to all those DNAadoption.com volunteers who helped sort out that case! I loved that Kathy Johnston pointed out the ancestors that you can inherit X from come in a Fibonacci series of numbers for each generation. But the surprise delight was Leah Larkin’s endogamy presentation. She is the new editor of the Journal of Online Genetic Genealogy (JOGG) at JOGG.info and has endogamy on her Cajun side. This is a very hard topic to explain and to deal with in your genes but she aced this talk and her slides were terrific. I promised my seatmates that I would post the URLs of some of the tool she mentioned in her slides so here they are. 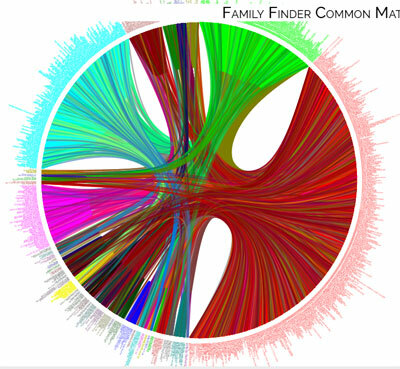 Try http://learnforeverlearn.com/ancestors/ for a graphic display of endogamy in your tree as well as many other features. Here are 12 generations of my family tree, only the Norwegians go back far enough for any endogamy to show and, as I suspected, the Hordaland folk, in the center, were somewhat endogamous. If you click on an ancestor you will get an orange box with his information and how he is related to you. Plus the lines descended from him will get bolded. Rumor has it that this may become a yearly event. I hope so! Would be nice if this became a yearly event in San Diego. 😉 I guess it could be anywhere, just has to be after my tax deadline so that I can easily attend. I was actually impressed with the presentation on endogamy. I grew up playing by the banyan trees (it was too large to climb but we played around & in between them). And perfect timing, as of yesterday after we uploaded an old project member’s autosomal results to GEDmatch finally! Of course a perfect example of what was discussed BUT unlike the other people, we have a lot of much closer relationship than what I heard was boasted. 😉 My aunt is the 4th match after 2 Maoris to this Hawaiian man (his daughter is obviously the closest match) and my mom is highlighted. Only real tie is that they (this man and my mom’s father) have the same connection to that island, not the same district. Anyway, I’m so glad I got to see you. I promise that I’ll have to STAY at the hotel so that way I can hang out more rather than going back & forth between LA & SD. Hi Kalani, I saw you several times at the conference but didn’t get a chance to say hello. We met at RootsTech and are both on the Azores list. Kalani, my long-term hope is that by working with “easy” endogamous groups like Cajuns (not just Cajuns, of course, and not that any endogamous group is easy), the community can come up with some best-practice strategies that will help with more challenging groups, like Polynesians. Sorry we missed connecting with you at the conference. There were several of us from DNA Adoption there. The link to your slides is not working for me. I got it to work by typing it in. I had to close the DNAgen screen that was used to add the bookmarks to Chrome before I could use the tools. Would help if the program title did not cover a lot of the data. Also would help if we could select a lager number for the matching %. Way too many matches to see the names easily. It was a great meeting indeed! 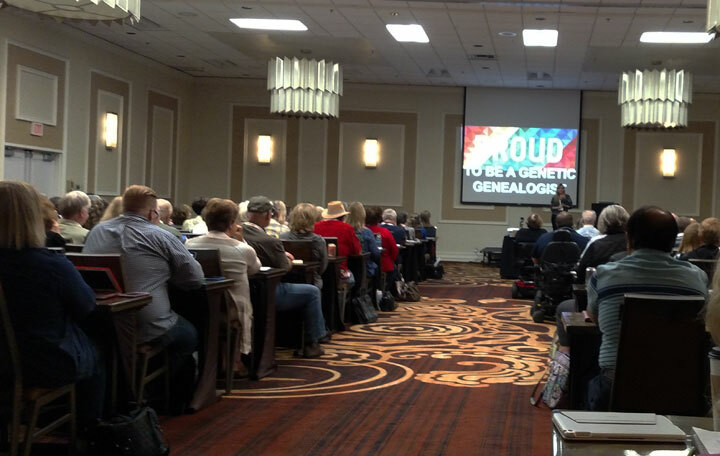 Nice to have a conference devoted entirely to genetic genealogy. I recall hitting the too-few GG RootsTech presentations in February (signed up to go again in 2017). Also, I learned my lesson from the SCGS to grab a seat early in order to avoid getting locked out! It was good to see you again Kitty. Keep up the great work! Great conference! I am looking forward to the videos since I missed the endogamy presentation. Yes the Lisa case was riveting!!! I hope it is an annual event!!! Oh…..and Kitty is a delightful speaker! Thanks for all the information. It would be great for an annual meeting somewhere centrally located. Looking forward to the presentations when they are offered. Thanks!!! !